Holy Communion at 11am on the First and Third Sunday of each month. Parish church, formerly part of church of Premonstratensian abbey founded 1165 by Walter de Bolbec. Chancel c,1200-1210, north transept and tower mid C13 except for belfry stage of tower, C14. Repaired and adapted as parish church 1752 by Lord Crewe trustees, transept aisle rebuilt 1854, east end rebuilt 1881. Squared stone with dressings; stone slate roof. L-plan, with tower at end of north transept. Early English style. Tower in 4 stages: chamfered plinth, set-backs and string courses; clasping buttresses, north-western with newel stair (lit by chamfered loops) rising to belfry, north-eastern with gabled heads below 2nd stage. Boarded doors on west and east; western has pointed arch of 2 moulded orders with trefoil-headed recess to north, beneath roof weathering of pre-1752 village chapel; eastern has double-chamfered arch beneath steeply-pitched roof tabling of contemporary chantry chapel. Lancet on north in triple-chamfered surround; similar window, its head widened, above west door. Belfry stage has openings of 2 trefoiled ogee-headed lights with quatrefoil over, and plain parapet. To south of tower, 4-bay west wall with central buttress formed from stub of north wall of abbey nave. 2-light windows with Y-tracery, the southern C18 copies. 2-bay east aisle of transept has 2-light windows in C14 style and lancet to north (blocked pointed windows above aisle roof date from use of an upper floor as schoolroom, 1828-1851). Chancel has 2 lancets on north and south and a C19 triplet, with shafted jambs, on the east. Interior. Tall triple-chamfered tower arch; aisle arcade of pointed double- chamfered arches with broach stops and chamfered hood, corbels and round column; triple-chamfered transept arch on triple-shafted jambs, the broader central shaft with fillet. Shouldered doorway to tower stair. Chancel lancets, have lost jamb shafts; rear arches of east lancets form part of 5-bay wall arcade. Triple sedilia on south largely C19; further west quirked jambs of blocked sacristy door. Plain C12 or C13 font. 6 complete medieval grave slabs in transept floor, including 2 to abbots and 2, with appropriate emblems, to foresters. Small panels of C15 glass, 2 with figures of Premonstratensian canons, in chancel windows. C18 arched commandment, creed and pater boards: Old wall safe in transept aisle. Carved and panelled chancel ceiling of 1881; sanctuary panelling, and reredos of 1890, carved screen and seating 1913. ‘The Premonstratensian Abbey of St. Mary, Blanchland, Northumberland’, W.H. Knowles. Arch. J. LIX (1902) 328-41. Blanchland Abbey (a Priory until the thirteenth century) was founded in 1165 by Walter de Bolbec and thus celebrates its 850th anniversary this year. It belonged to the Premonstratensian Order which was founded in Prémontré in Picardy by Saint Norbert in 1120 and as an order of Canons Regular, followed the Augustinian rule. The canons wore white habits, thus a possible origin of the name ’Blanchland’. The priory/abbey may not, however, have been the first church on the site, though evidence is scanty. Following its dissolution in 1539, the very long, but narrow, and probably aisle-less nave was mostly demolished, though fragments of its south wall survive. The Abbey gateway survives as does the Prior’s House, now the Lord Crewe Arms. The estate came into the hands of Lord Nathaniel Crewe, Bishop of Durham in 1708. Since his death in 1721 it has been administered by a charitable trust in his name. Only the north transept with its tower and choir of the abbey church remains, the present parish church. The external roof line and height of the arch into the transept give some idea of the majesty of the original building. 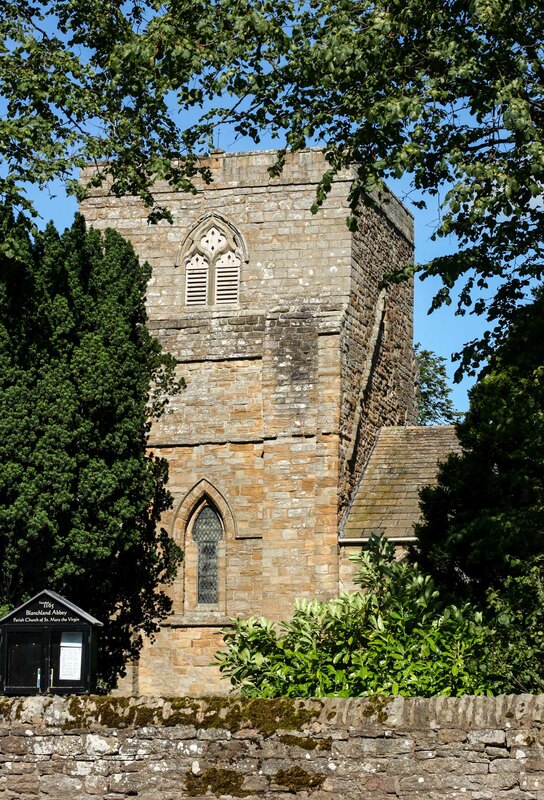 The chancel is said to be early thirteenth century, the transept mid thirteenth century, as is the tower, which has a fourteenth century belfry stage. An early thirteenth century cross stands in the churchyard. The building was extensively repaired in 1751-2 when it became a parish in its own right for the first time. Following the dissolution a chapel was built against the west wall of the tower, and was used subsequently as the village school, its roof line is clearly visible. The transept aisle, rebuilt in 1854 now includes St Gabriel’s Chapel, used by the parish for most weekly services. On the north wall above this, two large window openings formed part of the early nineteen century village school, removed in 1851. The east wall was built in 1881. The transept roof was replaced in 1815 and the fine panelled wooden ceiling of the chancel was done in 1884. Other woodwork is nineteenth century, including the 1890 reredos, with further additions in 1913, especially the pews. The (probably fourteen century) lancet windows in the chancel were re-glazed in the nineteenth century, but with zinc rather than lead latticework. This is now failing badly and will soon be replaced. The fine memorial windows on the east wall are the work of Leonard Evetts. The complex architectural history of Blanchland Abbey is not yet fully understood. We hope that further interpretative work may be possible soon.